I wrote last summer about how my biggest challenge in raising bilingual kids is getting them to actually speak in French. There is no question that they understand it. They also read it very well, and my oldest does a decent job writing it too. So why can’t they just talk already?! When I ask them a question, why do they insist on answering in English? I decided a few months ago that it was high time that they opened their mouths and expressed themselves in French. I gave them lots of time to get used to the idea. I waited until I knew beyond a doubt that they were capable of doing what I asked them to do. And then, once those pieces were in place, I took action. I came up with a system that required them to speak in French outside of their usual reading and lesson activities. The reward system – good or bad? I have a friend who does not use rewards at all with her kids. She has her reasons and the way she runs her house works for her family, so yay for her way of doing stuff. However, that’s not me. 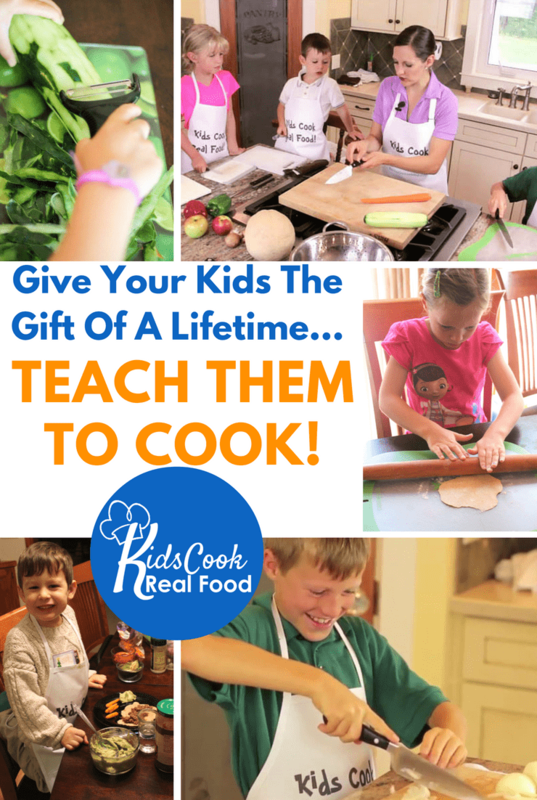 I tend to go by the philosophy that younger children need a motivator to get them started until it becomes a habit and they realize the benefits of continuing the action on their own. 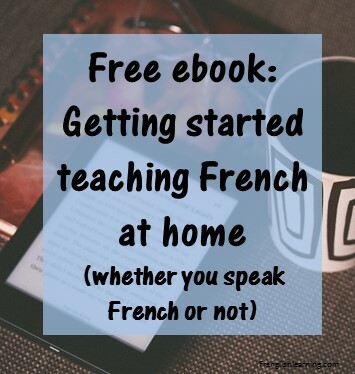 In terms of speaking French, that means that I need to give my kids a boost to motivate them to get started. The idea is that once they realize that they can do this, they won’t need the motivator as much. Then, further down the line when they can conceptualize that practicing French now will help them in the long term, we’ll have hit a home run. Hopefully we can drop the rewards then and the learning itself will become the reward. Needless to say, we aren’t there yet! What kind of reward system? When I was in French Immersion at school, one of my primary teachers came up with a system where we had printed play “money” in the classroom. Each student was given so much money to start. Then, if we caught another student in the class speaking English, we could ask for “un dollar” and they would have to give it to us. Periodically during the year, we would have a store where we could spend our play money and get rewards. I don’t remember any of the stores or even if we made it to that point because the system didn’t work. It wasn’t long before we kids figured out that if we collectively decided not to police our peers, the system would fall apart and we could just speak in English without consequences. I, ahem, may or may not have been instrumental in this process (so sorry Mademoiselle Monteiro). Given my school experience, I didn’t want a system at home where my kids would need to police each other. I also wanted something that would be a positive reward rather than a negative one (the whole carrot vs the stick thing). I also didn’t want something that would penalize them for speaking in English. My kids are not chatterboxes. They are very quiet and it can be a challenge to draw them out and get them to let me know what they are thinking. If they have something to say, I want to hear every word regardless of the language they choose to use. 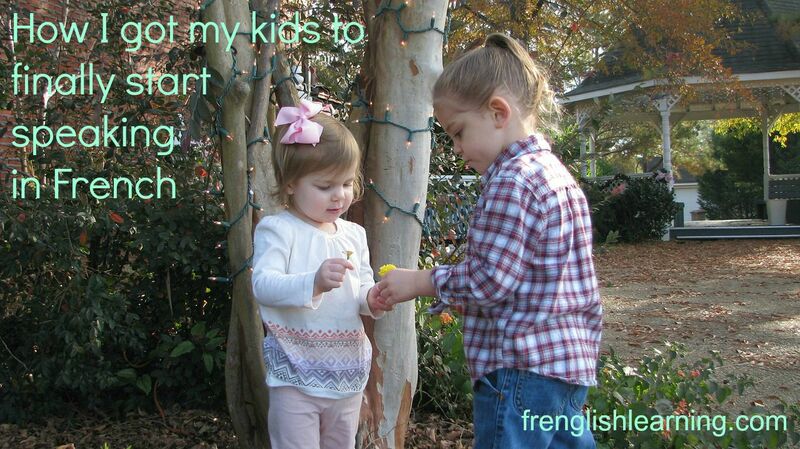 So, I needed something to encourage them to speak in French without discouraging them from speaking in English. I decided to go with a points system where they would get points for every sentence they spoke in French on any given day. I decided to go with sentences rather than words to make it easier to count. I started with a goal that was really easily attainable and a reward that they really wanted. I dangled a trip to the trampoline park in front of them as their incentive. We had never been and it’s pricey. They had been wanting to go there forever. I could have easily gone with a less-expensive reward, but I also wanted to check out this place as a possible birthday party venue, so it was win-win when they got to go. In order to claim the reward, my daughter had to earn at least 25 points. My son also had to earn at least 25 points. Combined, their total had to be at least 60 points. Why not just a single total goal? Because I wanted them to work together and support each other in speaking French. I didn’t want them to be poking holes in each other’s words saying the other’s sentences shouldn’t count for whatever reason. On the flip side, I didn’t want only one of them to earn all the points and have the other float along for the ride. Hence the combo of individual scores plus a team score for both of them. I printed out my tracking sheet (which you can download here) and put it up on the wall for them to see. They thought it was the best thing ever. They said their sentences within 5 minutes and skipped away to continue with the rest of their day. They both earned the maximum each day and we were at the trampoline park in 10 days. 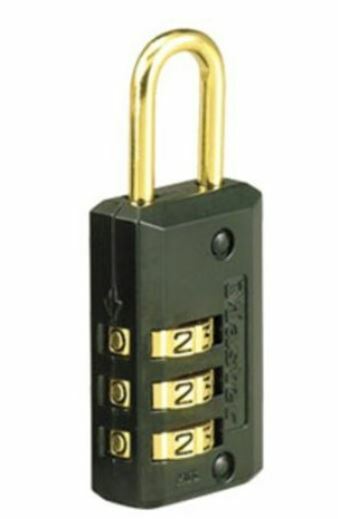 They started with the lock at 000. When they said a sentence, they moved the lock to 001, then 002 etc. I found this much better than listening to them tell me every 5 seconds how many sentences they’d said that day (did I say I wanted to hear every word of what they were thinking?!) , but I’m finding that they only carry the locks around sometimes. I had looked for super-light golf counters that they could carry around in their pockets, but could not find any that were a reasonable price. If you know where to get some, could you let me know? The rewards this time were individual. I knew my daughter had been salivating over a premium membership to a kids game site, so I put that as her reward. My son always wants Ninjago Lego sets, so that was his reward for round 2. They each needed 45 points this time to get their rewards. So, if you do the math, that meant it would take 15 days to get there the second time instead of 10. They both got their maximum each day and cashed in their rewards in 15 days. Saying “J’ai dit 3 phrases” (or 4, or whatever number) doesn’t count as one of the sentences toward the goal. Repeating what you just said doesn’t count as another sentence. Only one point for the same phrase each day. Repeating what your brother/sister just said doesn’t count either. I also had to institute a rule that if they questioned the validity of their sibling’s sentence, they lost a sentence of their own. (Remember my concerns about them poking holes in each other’s work – totally valid!). The target to cash in the reward for round 3 was 96 points (32 days). When they saw this, there was *a lot* of whining and complaining, but they still did it – at first. Here’s my tracker for round 3. I made a few mistakes with this one. First, the jump was too big. I increased it so much because I didn’t want to be spending $40 every 2 weeks on this project, especially for stuff they don’t really need. I was worried that if I cut down the value of the reward, they wouldn’t be as motivated. Turns out that I should have made it a smaller reward and kept the time period shorter. Mistake #2 was that I couldn’t think of something specific for my daughter – everything she wants is more than $20 – so I thought I’d give her $20 towards something she wants. As it turns out, that’s too abstract. She needs a picture of something dangled in front of her face. Problem #3 was vacation time. I don’t call this a mistake because it obviously wasn’t a mistake to take time off. I suspended the system while we were away with family for a week because I didn’t want anyone to feel excluded from the conversation happening in a language they didn’t understand. It was hard starting up again after we got home, but we made it. A few weeks later, we suspended the system again while we were camping for the same reason. I didn’t want the people we were with to feel excluded from a conversation that was happening in a language they didn’t understand. I also didn’t feel like counting sentences when we were at the beach. Enough is enough already! It was really hard to come back from the camping trips. The kids missed a few days and I was too tired and hot and in summer mode to draw them back in. When I recovered and started encouraging them again, they just said they didn’t want to do it anymore. Since the positive reward wasn’t working any more, I had to put “phrases en français” as one of their tasks each day. My daughter has her list of tasks on Toodledo (which also syncs to mobile devices including ios). She has to complete everything on her list before she’s allowed any screen time. My son has his chores set up on our magnet system (which I blogged about a few years ago here). In both cases, this is now something they are required to do as part of their day. I’ll still pay up on the latest reward when it’s done, but after that, it will just go on their chore list and that’s it. I’ll increase the minimum daily sentence requirement by a few sentences every week to gradually ramp up. Yes, absolutely, I would implement this reward system all over again even though the last round hasn’t worked the way I anticipated. The first round was the little boost they needed to realize that they could in fact speak in French without the earth opening and swallowing them up. The initial rewards gave a positive association to the process that has not been lost. They practiced enough that it has become a habit to a certain extent. Yes, I still need to put it on their chore list, but now it’s just another thing to do rather than an insurmountable obstacle. I realize that 36 sentences is not a lot and we still have a long way to go, but as they say Rome wasn’t built in a day. If it takes 5-10 minutes for a 3-way conversation where each kid says at least 36 sentences and we add 5 sentences each week, they will be up to about ½ an hour of active discussion by Christmas and 1.5 hours by next year. That, my friends, is a success in my books. This entry was posted in 11+ years, 4-6 years, 7-10 years, Advanced, Bilingual parent, Immersion, Intermediate, Other, Parent speaks some French by Leanne. Bookmark the permalink.